The Piha Community Library is a community asset for which the people of Piha have good reason to be proud. It is situated in the Piha hub alongside the Piha Community Post Office, Piha Store, Piha Campground and the Piha Cafe. 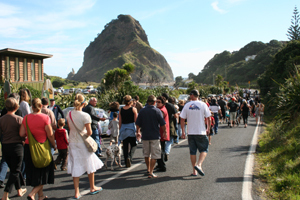 Originally an informal, independent, Library Group, it combined with the Piha R&R in the 1990’s, as that was considered the best arrangement to maximise the fundraising and grant application process required to fund the construction and development of a new community building to house the Library and a proposed Heath Centre. In 2009, the Library group formed an independent Charitable Trust to oversee the management and operation of the Library and Library service in the community building owned by the Piha Ratepayers & Residents Association.